Disclaimer. This web site is for research and educational purposes only. The information given in this site is not intended to replace a therapeutic practitioner relationship. Hiking is one of my hobbies. This picture is near the summit of Mt. Cathedral, East of Melbourne. I'm going to give my health journey first in this Bio so readers know better where I am coming from. Then comes the academic stuff. To fast forward to my Staph Toxin Illness journey and solutions, please scroll down this page. Everyone's life, whether they are conscious of it or not, is a health journey. No one has perfect health as I would define it, but we are all in need of growing, healing and adjustment in certain areas whether they be physical, spiritual, mental or social. Our situation changes as we travel through life. Some travel a more rocky road then others. Our decisions have a lot to do with our journey, but also often things happen that we have little or no control over. Some health issues are full of meaning and others appear meaningless and empty of all but pain. I am not able to explain everything, either in my own life or others but I do believe in and enjoy seeking for solutions and answers. They often can be found. On this page I share my personal journey in an open and honest way -- the challenges, the answers and the things still not answered. In childhood I suffered from the classic infections of my time like mumps, measles and chicken pox. I probably had an issue with eating too much dairy products and sugar because I developed glue ear and ended up having my swollen adenoids removed when about 7 years old. As a child, I was a chocaholic and ate a fairly standard omnivorous diet. I consumed a lot of sugar. When I was 13 my older brother became a vegetarian and I decided to give it a go too. I enjoyed it and have continued to be on a plant-based diet. Our mother was very accommodating and allowed us to come into the kitchen to make our meat alternatives. Not long after this I stopped drinking caffeine beverages and cut down on chocolate, eventually giving it up completely and changing to carob-based products. At the age of 13-14 I went through a period of major stress involving bullying on a school bus. I believe that this resulted in some hormonal imbalances that led to severe acne on my back. Eventually this ended up with me taking tetracycline antibiotics daily for about three years. I did not know anything about the problems associated with long term antibiotics or alternative treatments as a teenager. I believe that the combination of stress and antibiotics resulted in the development of Staph Toxin Illness with symptoms of fatigue and mild fibromyalgia. I did not find the cause or answers to this until decades later. You can read the full story of how I recovered later in this page. Another thing that occurred when I was 13-14 was a strong tendency to develop chilblains, especially on my hands. This appeared to be associated with a lower body temperature than normal. I still suffer from a tendency to chilblains in winter but have found that taking about a teaspoon of turmeric powder each day largely solves the problem. My body temperature is still below normal, but it does not seem to affect my health much, which is strange. I have done all sorts of things to try and correct this low temperature. I was brought up in a secular home. My interest in spiritual health began when I was nearly 16. I was having problems with my eyes and, not finding help from mainstream medicine, I went to the local library to see if I could find a book on faith healing. I did not find exactly what I was looking for, but I did find a book called “Faith is the Answer”. This book introduced me to the idea of praying to a loving Father in heaven and of trusting in God, even when you don't understand what is going on. It was a radical thought to me. But I tried it and found it helped. I started reading the Bible and began to realise that the evolutionary theories that I had previously accepted were based on unproven assumptions. Finally, I met Jesus Christ and found my spiritual health needs were fully met. I have not had any reason to look further ever since. Two of the most helpful books to me in my journey, other than the Bible, were "Steps to Christ" and "The Great Controversy". My eye problem cleared up. Between the ages of 16 and 19 I looked around at different Christian churches. When I was 20 I joined the Seventh-day Adventist church. The health-conscious approach of this church community helped solidify some of my previous experiences with vegetarianism and being careful with addictive substances. At about the same time that I read the book “Faith is the Answer” I also tried transcendental meditation which had been recommended to me by an optometrist. I got my own personal mantra and instructions sent to me in the mail from an organisation that promoted meditation. I sat with my back to the wall for about half an hour in the morning and used to go over this mantra. But I did not continue with TM due to the fact that meditating on life principles from my Bible study was proving more helpful to me than emptying my mind in trance meditation. Life was not all easy after I found my spiritual rest. Unfortunately, I became a fanatic and entertained a kind of 'salvation by diet' for two or three of years. I became very thin and focused way too much on my stomach and what I was eating. I tended to isolate myself and eat on my own. In the end I got sore knees from malnutrition and went to my local GP when I was in my 6th Year of med school and said, “I think I'm underweight and have got sore knees as a result”. He advised blood testing. I got a call from him saying he needed to send me to a haematologist because of changes in my blood. I went and sat in front of this haematologist who was wearing a white coat. I will never forget his words. “David, the changes we see in your blood are what we find in folk with bad anorexia or who are starving in Africa”. My immediate thought was, “David, you have been a fool”. This experience cured me of the worst of my fanaticism. The rest cleared up gradually, especially after I got married and stopped eating most of my meals on my own. I know about dental disasters. I needlessly spent $4000 on dental work in 1998 that I later found out was totally unnecessary. My problem was not a 'micro-crack' that required root canal therapy and then (after this failed) a dental implant (which also failed due to a dentist 'unscrewing' it). I ended up with a hole in my mouth and in my wallet. Actually the problem was simply tooth grinding - which the dentist missed. In1998 I also discovered that I had bad osteoporosis of the spine and elsewhere. I had climbed up a mountain and got a sore back. I went to a colleague and he suggested a plain X-ray. The X-ray showed up the osteoporosis. I believe this was related to my dietary fanaticism and the long term tetracyclines. I have largely managed to treat this over the years with natural things like exercise and mineral supplements. Very happily married since 1992. Two children and Tombo the dog. I like hiking (though, I do confess to becoming tick-phobic), mountain biking, gardening and doing odd jobs around the house and on the cars. I am interested in Bible prophecy, world events and, I guess not surprisingly, lifestyle and preventative medicine. Education: Graduated as a medical doctor from Auckland University in 1990. Diploma in Clinical Nutrition, 1996. Fellow of the Australasian College of Nutritional and Environmental Medicine in 1997. Fellow of the Royal Australian College of General Practitioners in 2005. My special areas of interest, with post graduate studies, are nutritional and environmental medicine. As part of environmental medicine I have been seeing patients with sickness as a result of mould exposure, chronic environmental poisoning and occasionally (as an unexpected add on) vector-born infections. Part of 1989: Rural hospital work in remote Papua New Guinea. This is when I found out that I was not a 'blood and guts' doctor. 1990-1991: Hospital based work in New Zealand. 1992-1999: Very busy rural general practice in New Zealand. 1999-2005: Part time general practice and part time nutritional and lifestyle medicine in NSW, Australia. My special interest in the treatment of chronic fatigue syndrome (CFS) and related disorders began in about 1999. My interest in CFS did, however, predate 1999 because in the year 1994 the GP I was working with in New Zealand took a whole year off from work because of a CFS-like illness. 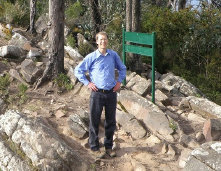 2005-2012: Residential lifestyle doctor at Highwood Lifestyle Retreat. Supervised inpatient programs. Also ran a CFS outpatient service. 2011-2014: Part time work at a GP after hours clinic in Melbourne. 2012-present: Integrative General Practice at the National Institute of Integrative Medicine (NIIM) with a special interest in CFS, fibromyalgia and related disorders. WPlease read this section in the context of our Sinus Page. Staph Toxin Illness has been a major issue in my health journey. My nose and sinuses were colonised by MARCoNS (Multiple Antibiotic Resistant Coagulase Negative Staph). I believe that the Staph was probably acquired at birth and that my Staph turned nasty and started to produce toxins due to severe stress from school bullying and a long course of tetracycline antibiotics for acne as a teenager. I believe that one of the conditions that causes Staph to start producing toxins is severe stress, although this has not been documented in studies to my knowledge. Causes identified in studies, including antibiotic courses, are given on our Sinus Page. The Staph Toxin Illness gave me fatigue and mild fibromyalgia. In addition to my sinus issue the Staph was on my skin and caused me to get discoid eczema during another period of severe stress after our house burnt down and our next-door neighbours died in the 2009 Victorian Black Saturday bush fires. I became aware that I might have toxic Staph in a strange way. I was trying to assess what, if any, benefits for energy might be found from the use of a Red 633 intranasal 'Vielight'. The use of this device appeared to cause some kind of Herxhiemer reaction (a feeling of malaise from the killing of bugs) and so I suspected some kind of nasty bug in my nose. A swab confirmed that I had MARCoNS. I successfully cured the problem by using a course of BEG spray (which I terminated after about ten days due to it causing a flare up of gut thrush) followed by a combination of coconut oil/water nose spray and inoculations of anti-staph bacteria. These inoculations were daily initially and then became gradually less. On days I did not inoculate I used the coconut oil/water nose spray. The friendly anti-Staph bacteria I used were Bacillus subtilis and Lactobacillus plantarum. B subtilis is a very well studied and 'GRAS' (General Regarded As Safe) bacteria that is a normal human commensal. It is very good at inhibiting Staphylococcus aureus (Reference 1 below). It has also been used to reduce unwanted bacteria in the mouth (Ref. 2 below). L. plantarum can strongly inhibit Staph (Ref. 3 below) and appears to have better adhesive properties than B. subtilis - that is, it sticks better in the nose. In using these anti-Staph bacteria the aim is for them to eradicate the Staph. They may or may not colonise the nose. I think, most likely, as it my case, they will not colonise the nose but just get rid of the Staph and make way for friendly non-Staph bacteria. I must emphasise that this approach is quite firmly experimental as no large scale, double-blind, placebo controlled, randomised, multi-centre trial has been conducted on the use of either L. plantarum or B. subtilis in the safe and effective eradication of nasal Staphylococcus aureus. When I did my treatment I was not aware of the probiotic Lactobacillus sakei which is likely even more effective. It may not have been available at that time either. But this is the preferred probiotic nowadays and I would recommend using this rather than B subtilis or L plantarum. My use of the anti-Staph bacteria caused significant herx (die-off) reactions. I used this method because I did not want to use antibiotics any more and because I wanted to stop the Staph on my skin from re-infecting my nose. After using this procedure for about three months I felt that my symptoms were gone. A great blessing, to say the least. I call it a blessing, because in my personal health journey, for me, it felt like it was an answer to prayer. I got the herxing about 3 days after starting the inoculation and the benefits were felt after about two weeks. Things then went up and down but gradually got better until I felt I was 'normal'. My current 'insurance policy' regime is daily use of a weak xylitol/tea tree oil/water mixture. Having tried various methods, I now believe that the best way is to use only L. sakei spores and if you can't obtain this then L. plantarum spores cultured in an electric yoghurt maker using pure coconut cream mixed with the culture spores. I have found that the best coconut cream is 'Ayam' brand. I tried another coconut brand but it just did not turn out as good and did not smell like yoghurt. Once the yoghurt is made, a small amount, about 1/4 teaspoon, of the culture can be mixed with clean water in a nose spray bottle and sprayed up the nose. An alternative would be using a larger amount of yoghurt with clean, warm water in a neti pot (which I have also done with good effect). With the nose spray method, I would suggest building gradually up to 2-3 sprays both sides twice a day. The reason for the gradual build up is that Lactobacillus inoculation can produce severe herxing. For the L. plantarum culture spores I would recommend using about 1/8 to 1/4 of a cap of the product called 'Probex' made by Metagenics (picture below) or the product "Jarrow Formulas, Ideal Bowel Support" available from iherb.com. I don't recommend using a product with multiple types of friendly bacteria but one that is just L. plantarum. However, I have used a mixed one before with Bacillus subtilis and some species of Lactobacillus, including plantarum (Enzymedica Pro-Bio™). It works okay, but B. subtilis just does not smell too good and I don't think it is as potent as the L. plantarum. Also, the left over yoghurt is not that great a taste. L. sakei is available from specialist online stores only at this stage (April 2019). Keep your spray bottle with the culture and water mixture in the fridge and discard and make it up fresh about every 3-4 days. Use the remainder of your culture as a yoghurt food to eat with meals. I purchased an electric yoghurt maker from within Australia at ebay for about $50. It was advertised as a "New Flora Automatic Yoghurt Maker \ Rice Wine Machine 7 Glass Jars FDA APP" (images below). This appliance has a timer that goes for up to 48 hours so it makes redundant the esky and aquarium heat/thermometer method (mentioned below). Once you have done your treatment phase and got over any Herxing, you could move to just using the inoculation a few times a week as maintenance. Or you could use coconut oil and water nose spray most days and the occasional inoculation. - Fill up the yoghurt making jar to 1/2 or 3/4 with 'Ayam' brand coconut cream or milk. - If using the cream I sometimes water it down with about a tablespoon of clean water. - Stir in about 1/8 of a cap of L. plantarum spores. - With the New Flora yoghurt maker it is necessary to fill the plastic container of the yoghurt maker with warm water that is about body temperature and then place the jar with the coconut cream and spore mixture in it. - Turn on the yoghurt maker and set it to 39 or 40 degrees Celsius. - Set the timer function for 12 hours. - When finished (after the 12 hours are up), put 1/2 tsp of the yoghurt in the nose spray bottle. - Add clean water to the nose spray bottle to fill it, then shake and it is ready to use. - Keep the nose spray bottle with the mixture in it in the fridge and every 3 days make a fresh nose spray bottle mixture. - The left over yoghurt can be eaten or stored in the fridge to use for a second spray bottle mixture before eating it or discarding it. Yoghurt makers that just use boiling or hot water to keep the culture warm are inadequate. I have tried this. It is necessary to have an electric one. Bacillus subtilis is the culture used to make the Japanese fermented soy product called natto. I have read that natto is made using a 36-48 hour culture period so that is what I did. This may be difficult using some electric yoghurt makers due to a timer mechanism on them with a maximum time of only around 12 hours. I cultured B. subtilis, and also initially L. plantarum, in an esky or chilly bin filled with water heated by an aquarium heater/thermostat unit. I used about 48 hours for my culture time. B. subtils appears to grow better when sprinkled on the surface of the coconut cream rather than mixed in. L. plantarum is best mixed in with the cream. I obtained my B. subtilis using ebay to purchase a natto starter kit from a Japanese site. I also used a probiotic product called 'Enzymedica Pro-Bio™' which I bought iherb.com. This probiotic has B. subtilis as the main ingredient but also has various Lactobacillus species in it, including L. plantarum. I have not used culture mediums other than coconut cream. The reason for the coconut cream is that lauric acid, which is in coconut, inhibits Staph toxins (see our Sinus page for details). It is likely possible to use another medium such as cow or soy milk if there was an allergy or sensitivity to coconut. L. plantarum culture smells and tastes like yoghurt. B. subtilis smells and tastes rather unpleasant in my opinion. Natto has similar qualities. Alternatives to using a spray bottle are to use an appropriate amount of the culture mixed with water in a neti pot or in a syringe. I have tried both. I prefer the spray bottle technique. Gonzalez DJ, et al., Microbial competition between Bacillus subtilis and Staphylococcus aureus monitored by imaging mass spectrometry, Microbiology. 2011 Sep; 157.Pt 9.: 2485–2492.